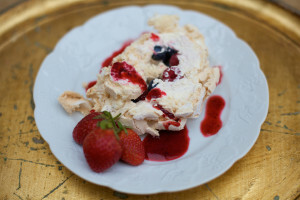 This delectable, fresh tasting pudding has long been a favourite with my regulars – it’s so easy and quick to make, it’s embarrassing but why spend hours slaving over hot puddings in the summer when this go-to extravaganza will make you the envy of your friends with very little effort. Whisk the egg whites until stiff – it’s less labour intensive with a free-standing mixer or even a hand held mixer at a push but don’t be tempted to use a food processor, you simply won’t get the required air in. Add the sugar slowly and keep whisking until the mixture is seriously stiff and glossy. Pour this into a Swiss roll tin lined with baking parchment and bake at 180•C for 15-20 minutes. Leave it to cool. 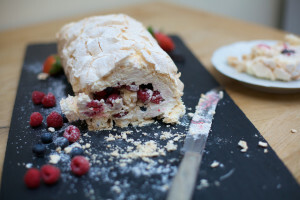 Shortly before serving, turn the meringue roulade out onto another piece of parchment. Whisk 450 mls of double cream – I add a generous teaspoon of vanilla bean paste, so much easier than fiddling about with pods, and sometimes some raspberry liqueur if I have any lying around. 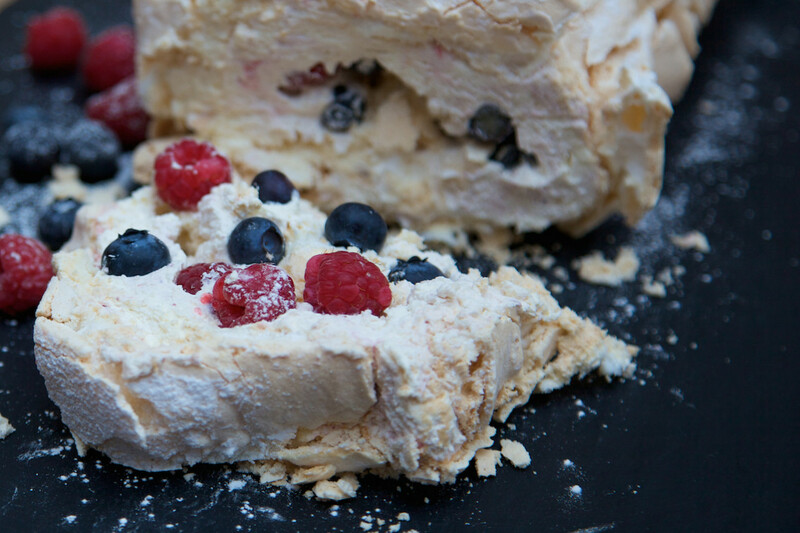 Spread this onto the roulade and sprinkle liberally with any summer berries you like. Then from one short end, gently roll the meringue, using the parchment to help. It really doesn’t matter if it cracks, it can’t help it and a generous dusting of icing sugar, as we all know, can only add to the appeal.